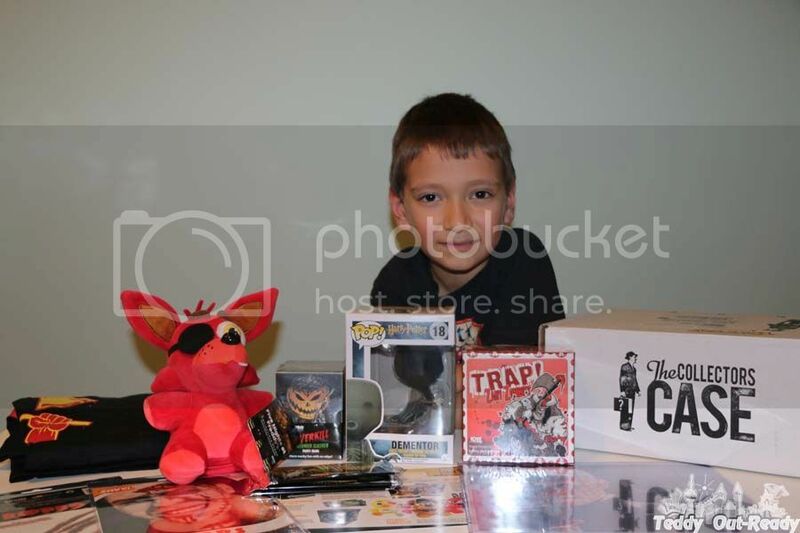 The Collectors Case is monthly themed, subscription box filled with 4-6 items including a chance of a celebrity autograph, T-shirt and bonus items. Those meticulously chosen products are the latest trends in the collectors' world. Items you find in a box are intended to support a fan experience and mostly from favorite movies, games, comics and stories. The value of each Collectors Case exceeds $60, while each box costs only $25 plus shipping and taxes! Basically, it is a good deal considering one T-shirt price is about $25, and subscribers get more goodies in addition to that. You can choose the size of T-shirt when ordering. The subscription is quite flexible offering various options to customers. You can choose one Month option so you get only one box for yourself or gift it to someone else. Or you can join monthly subscription and receive a case of goodies every month. Cancel or renew it any time. The Collectors Case we received was a combination of scary stuff, a game and Harry Potter themed items. Teddy liked Freddy's Funko Plush the most. Now they are best friends. I subscribed to various programs before, it was usually hit-or-miss. But with The Collectors Case everything is pretty much clear what to expect in your next box. The Collectors Case makes a nice gift even if you just choose only one month gift to family members or friends. You can select December pack or past packs from the Store. The only advice is to order as early as possible because popular themes sell out very fast and T-shirt sizes you need may not be available. For more information, please visit The Collectors Case. The company charges $10 US for shipping to Canada and the USA.